Hello there, and welcome back to Red Knits! There’s been a lot of excitement around here since I last posted, so we have some catching up to do. First of all, the location of “around here” has changed! I am fortunate to be on a dissertation writing fellowship this year, which means that I no longer have to go to campus. In order to have better job prospects for my husband and be closer to family, we decided to move back to Minnesota, and we are so happy with our decision! After 8+ years of marriage, we’ve decided it’s time to add a new little one to our family. We are so excited to meet our baby in February! 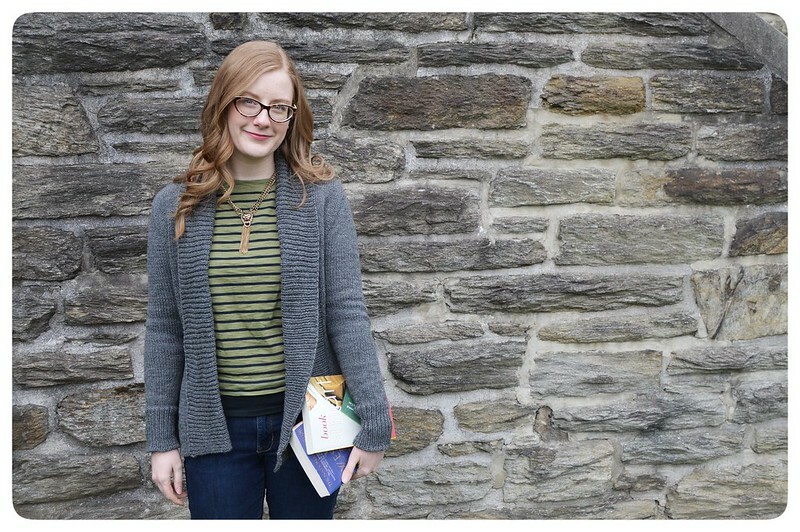 But this is a knitting blog, not a mommy blog, so let’s have a closer look at that sweater. 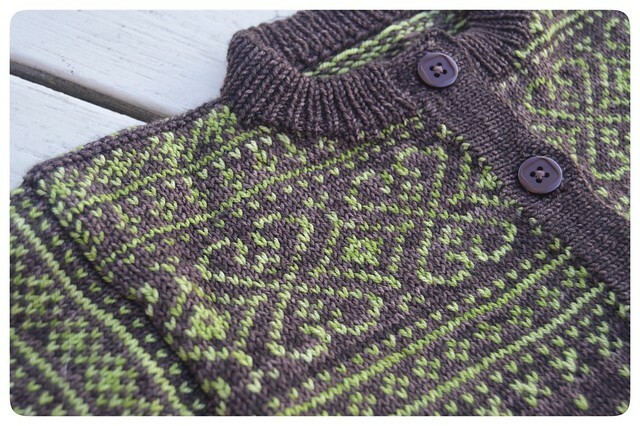 This is Sirdal, a traditional colorwork design that Dale of Norway has worked up in baby sizes. Steve and I picked out this yarn around the time that we had decided a baby was in our near future, knowing that we wanted a gender-neutral Norwegian sweater that would match those that I had had knit for each of us. Shortly after I got a positive pregnancy test, I cast on. This may be a little sweater, but it was a lot of work. 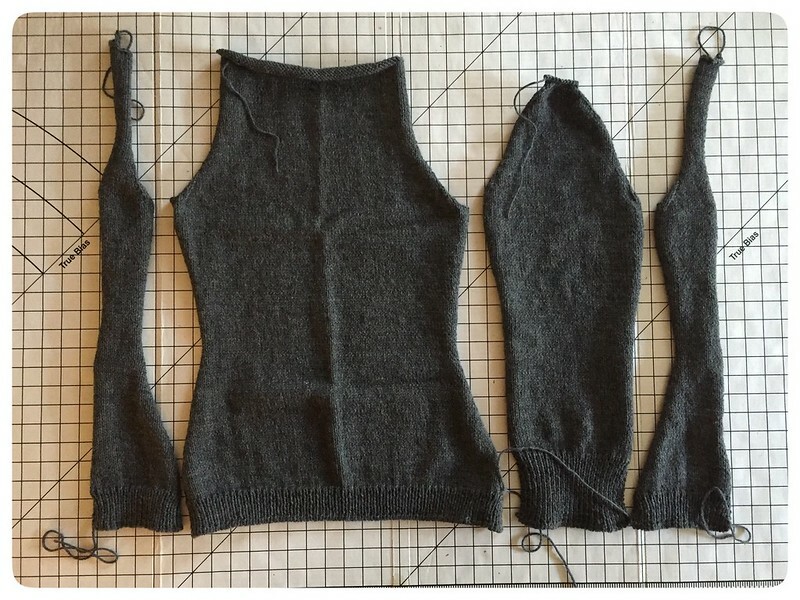 This sweater, like every Dale of Norway I’ve knit, is worked from the bottom up in three pieces–the body in one piece, and the two sleeves–before steeking and an exorbitant amount of finishing work. After a small border at the hem, the lower body and sleeves are worked in lice stitch (yes, that’s really what it’s called!). 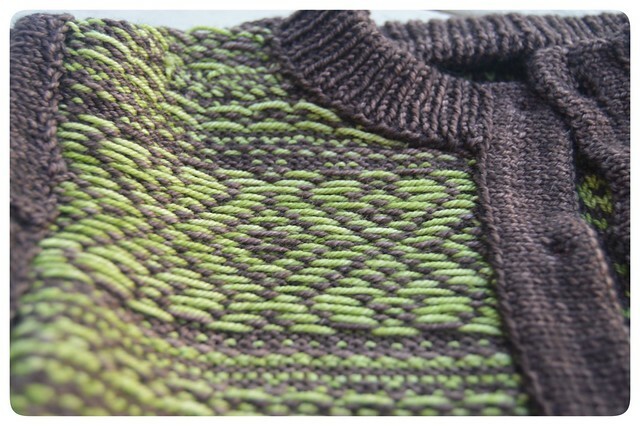 Here’s an inside view of the above section of the sweater so you can see my colorwork floats. As my grandma always said, the inside of the work should be just as neat as the outside. 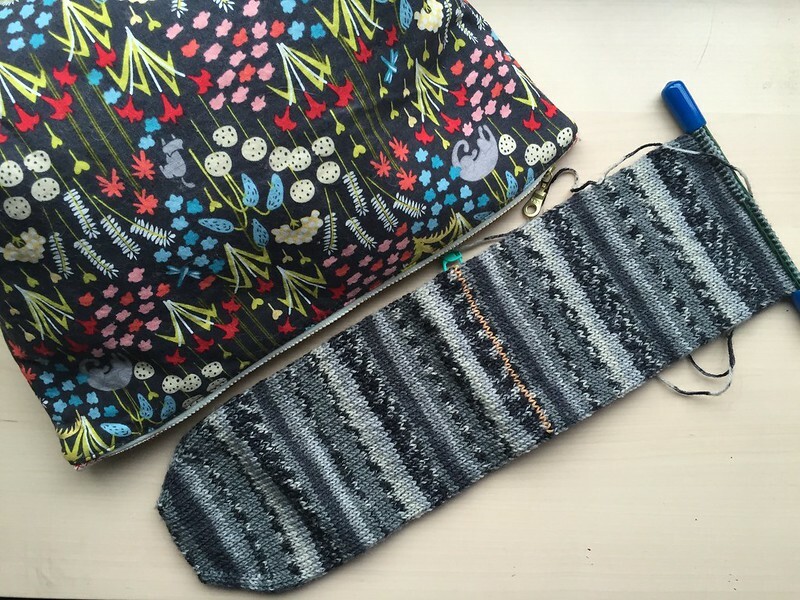 If you’re newly embarking upon colorwork, one way to ensure that both your insides and outsides are tidy is to pay attention to color dominance: do a quick internet search to see what it’s about and why it’s important. This pattern calls for a buttoned placket at the wrists, which I attempted on the first sleeve. I found it incredibly tedious to knit because I constantly had to break the yarn, and buttons at the wrist of a baby who’s sticking everything in its mouth seemed like a bad idea to me. 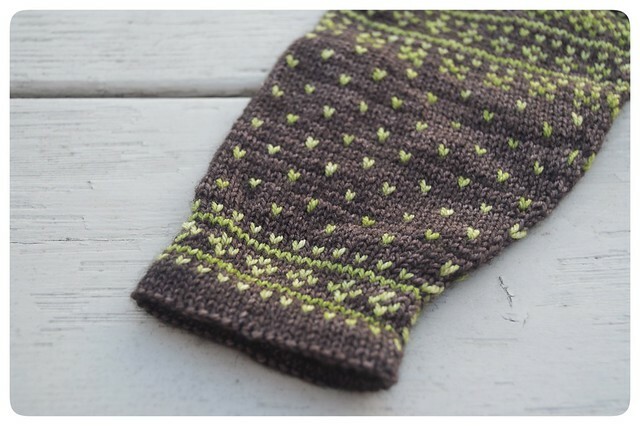 I ripped out the first cuff and knit a plain one by blending the instructions for another baby sweater in the same book with those for this one. It went much more quickly, and I’m very happy with the result. As I said, Dale of Norway sweaters in any size require a whole lot of finishing work. 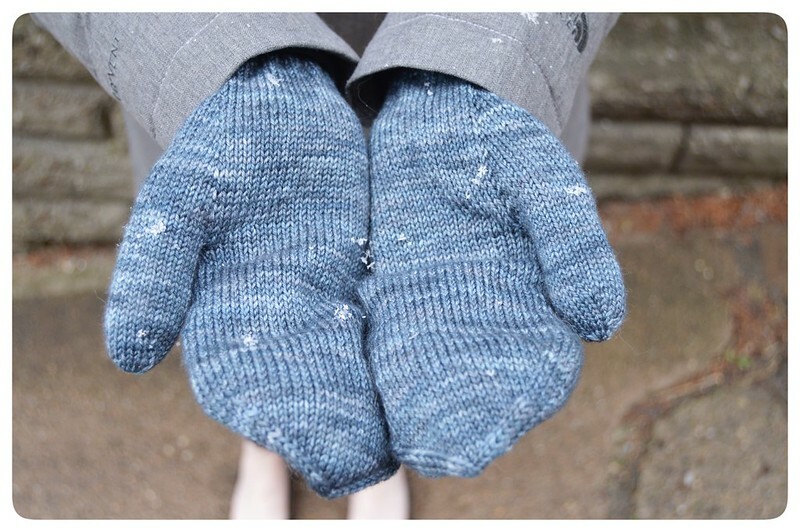 Not only do you have to steek–meaning, cut–your knitting (which no longer bothers me in the least), but you then have to sew seams, pick up and knit buttonbands, knit and tack down facings, stitch hems, and attach buttons. 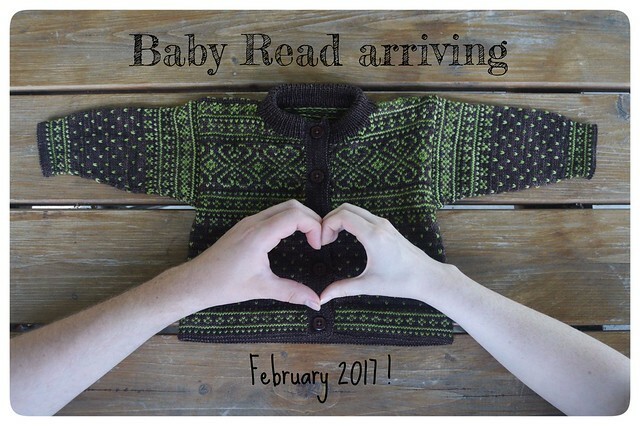 Of the 2 1/2 months I worked on this sweater, the last week or more was spent on the finishing work, and that was working on it monogamously because I wanted to use it in our pregnancy announcement photo. I recommend good podcasts and/or television and something tasty to drink. The very last step of this sweater was attaching buttons. It was a bit of a challenge to find something that was simple enough not to distract from all of the colorwork while still being a color match, but I managed to find some at JoAnn. These are basic, plastic buttons that should be able to withstand the many washings ahead of them. As you might guess, this is only one of many handknits waiting for our baby to arrive, and I’m sure there will be many more to come. 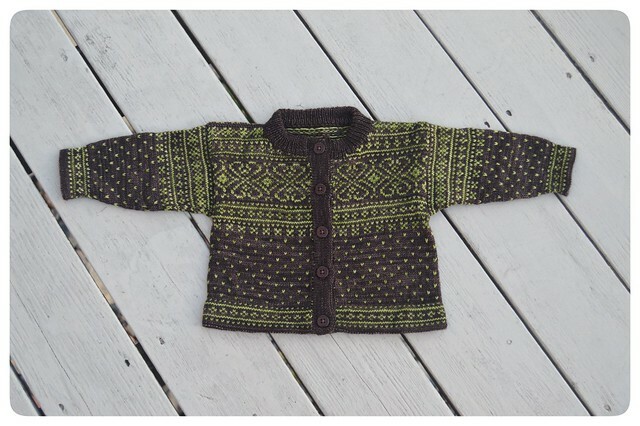 If you have any favorite baby patterns, especially gender neutral ones, I would love it if you let me know in the comments. I’m so pleased to share Georgetown, my cozy and versatile fourth year PhD sweater. If you’re new around here, I’m knitting a sweater in each year of my PhD to commemorate the process and maintain my sanity. 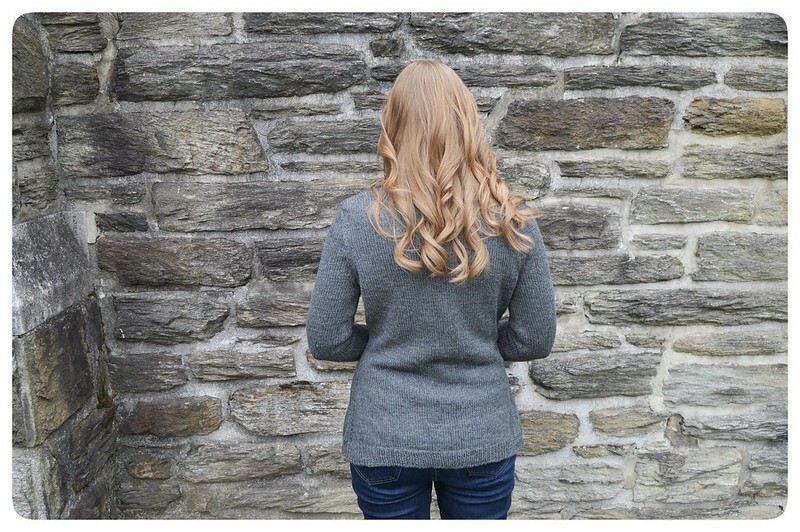 And if you’ve been around for a while, you may be wondering where sweater #3 is…it’s finished, photographed, and has been well worn, but it hasn’t quite made it over to the blog. Soon. I had some criteria in mind when I went to choose a pattern for this fourth year sweater. I knew that I wanted a cozy sweater for the dissertating year ahead of me. 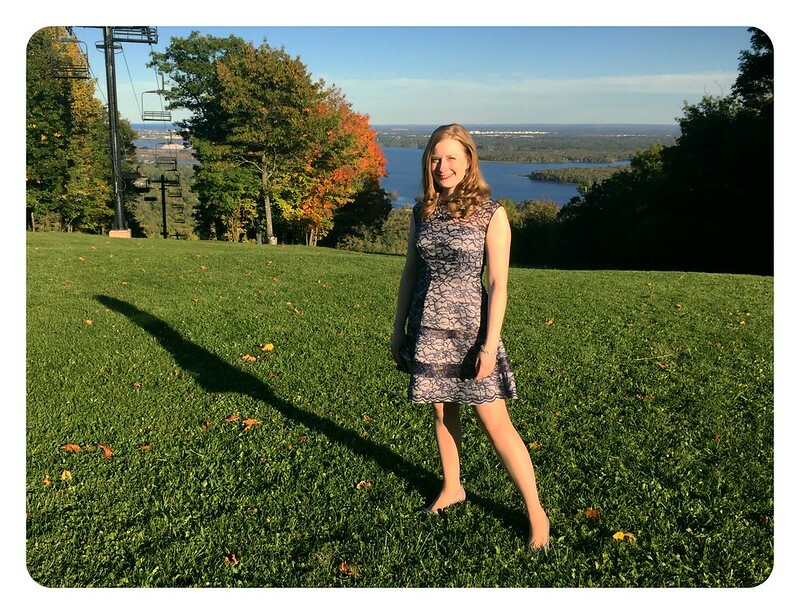 I wanted it to be very versatile so that I could throw it on with a variety of tops in my wardrobe and look presentable enough for a run to the library or an afternoon writing at a coffee shop. I didn’t want it to be too warm, but I also wanted it to be warm enough to get me through the winter months, even if we move back to Minnesota. 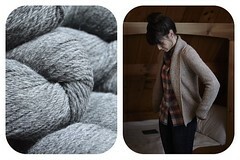 Ultimately, I settled on the Georgetown cardigan in heathered gray Cascade 220. Even though this is meant to be a cozy sweater, I wanted it to fit me well so that I could wear it to meetings on campus or even to teach (though I won’t be doing any of that next year while I write). 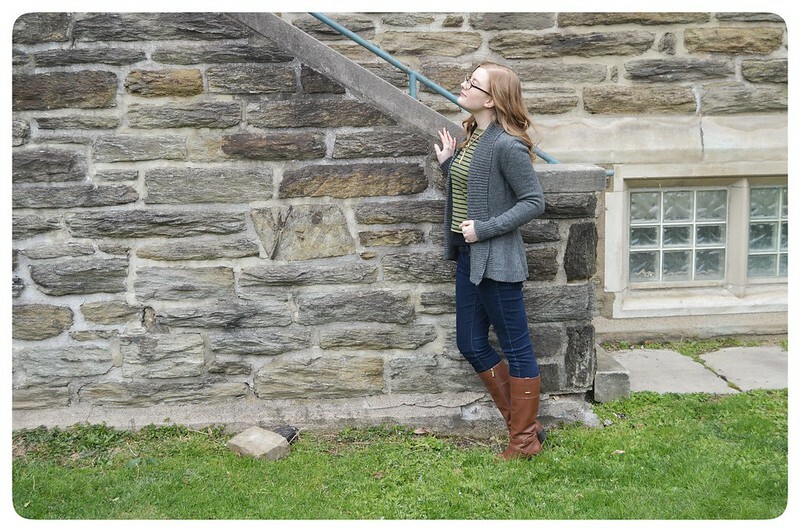 In order to get a fit I was happy with, I compared the pattern’s schematic to both my own measurements and a RTW cardigan I love. 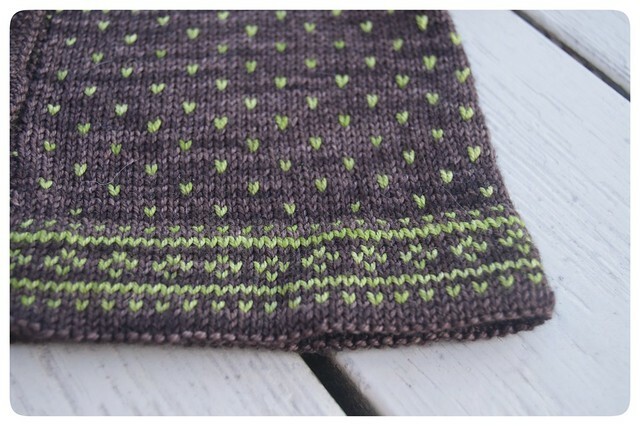 If you head over to my project page on ravelry, you can see where I’ve jotted down my measurements. The math came into play when I calculated the waist shaping using Ysolda’s book. This is one part of sweater fit that I’m still figuring out. I like to have some waist shaping because I’m a classic hourglass and don’t want excess fabric floating around my waist, but knitted fabric stretches, and it’s hard to account for that. In this sweater without any closures, I may have overdone the waist shaping a bit, but that won’t stop me from wearing it all the time. 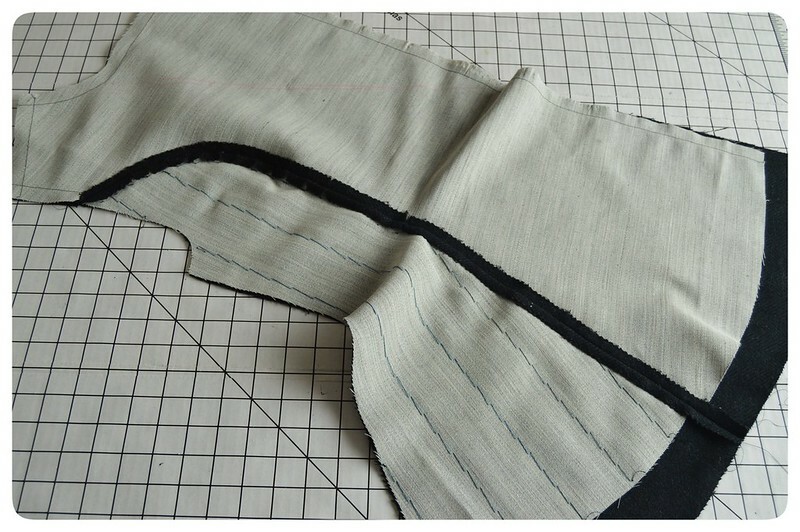 A nice feature of this pattern is that it gives both seamed and mostly seamless options for construction. 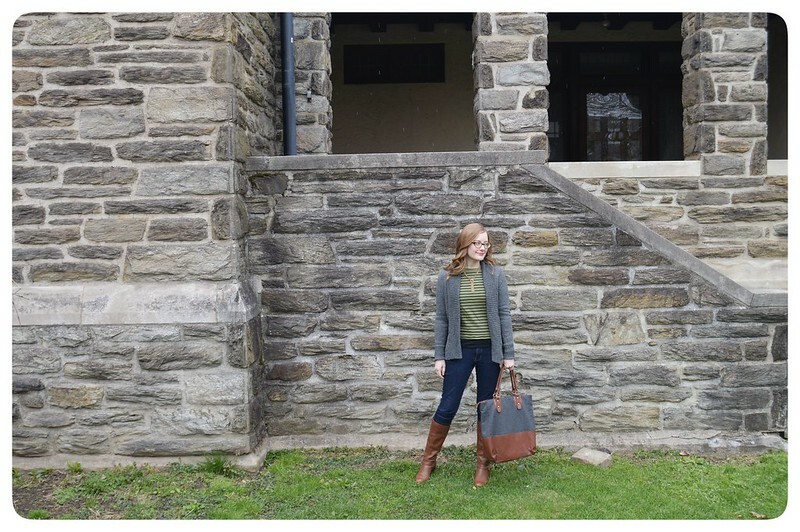 I like the structure of a seamed sweater as well as the ease of working with smaller pieces as I knit, so I went for the seamed option and was happy with my choice. That collar is eight inches of 1×1 ribbing over who-knows-how-many stitches, so it’s not for the faint of heart. It took me a good while to finish that portion of the knitting, but luckily I’m not someone who minds ribbing too much, and the big, huge collar is worth it. This sweater is exactly what I’d been hoping for, and I’m almost happy that spring hasn’t quite arrived so I can get a few wears out of it before things warm up. 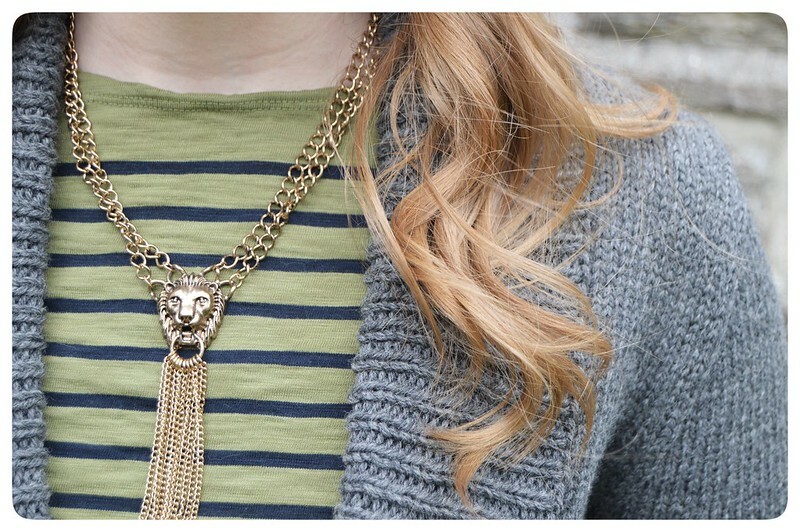 Best Part: the versatility of this sweater. I look forward to wearing it all the time! 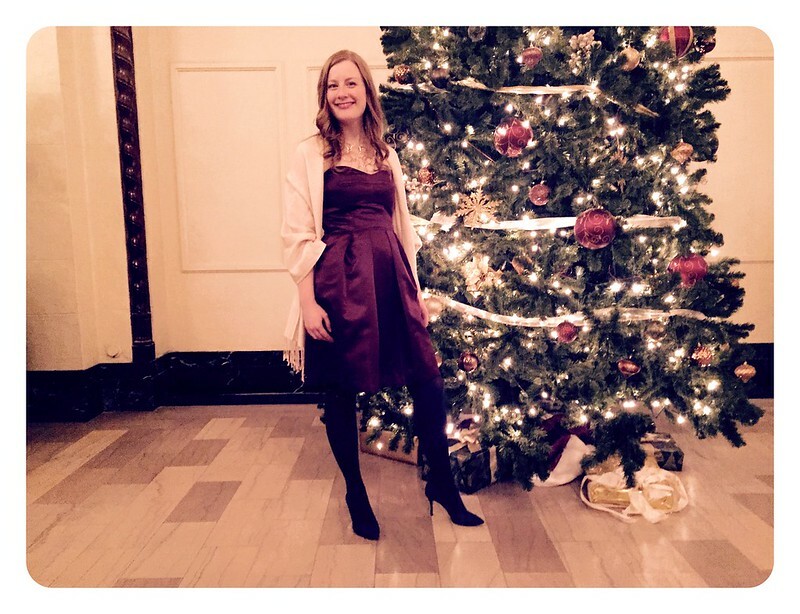 My sewing tends to fall somewhere between process and product: I sew garments both because I want to make them and because I want them in my wardrobe. But sometimes there’s a project that, if I didn’t want the product so badly, I would have lit the thing on fire. 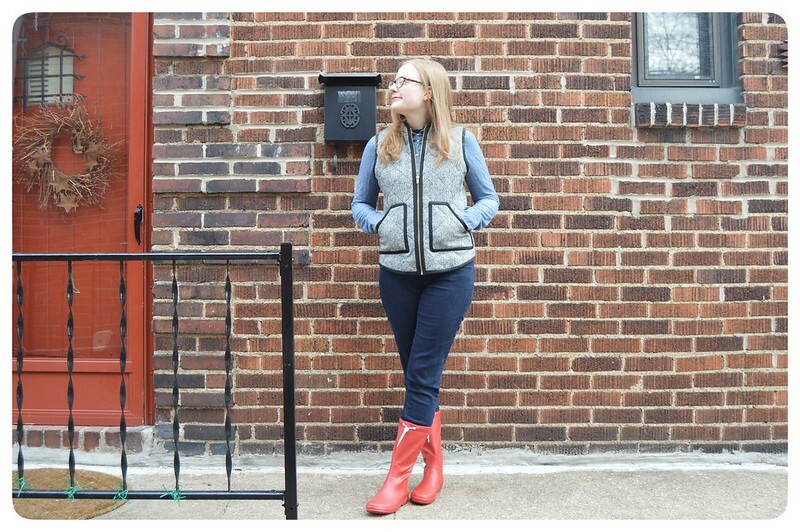 This vest is one of those projects. 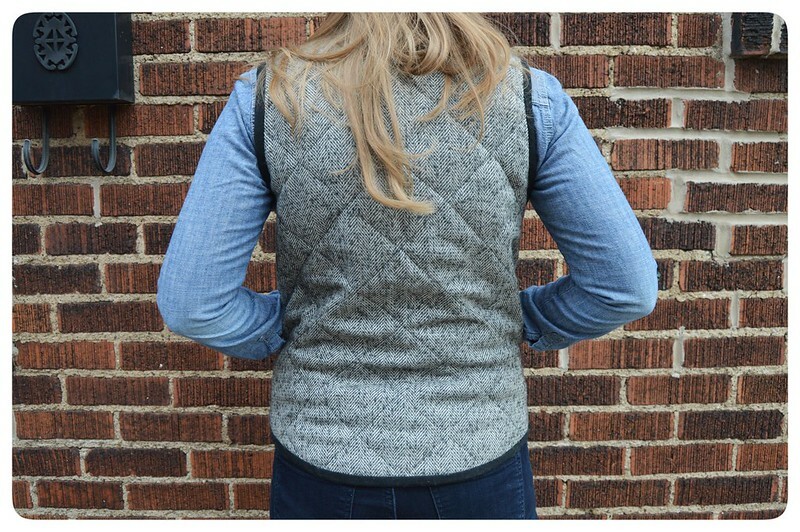 I think that Instagram and Pinterest are to blame for this vest. 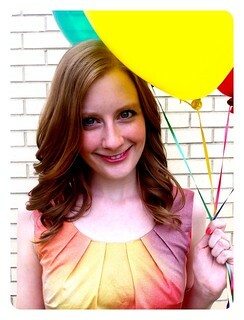 I saw cute outfits with the ubiquitous J.Crew vest all over the place, and you know how I love a versatile garment! I considered buying my own from a J.Crew outlet or on end-of-season clearance, but I just couldn’t get behind paying that much for polyester. If I was going to have this vest, it would be warm. It would be wool. I picked up Simplicity 1499 (a perfect dupe), ordered some herringbone wool from Mood, and got to work. Really, the fabric was where my troubles began. 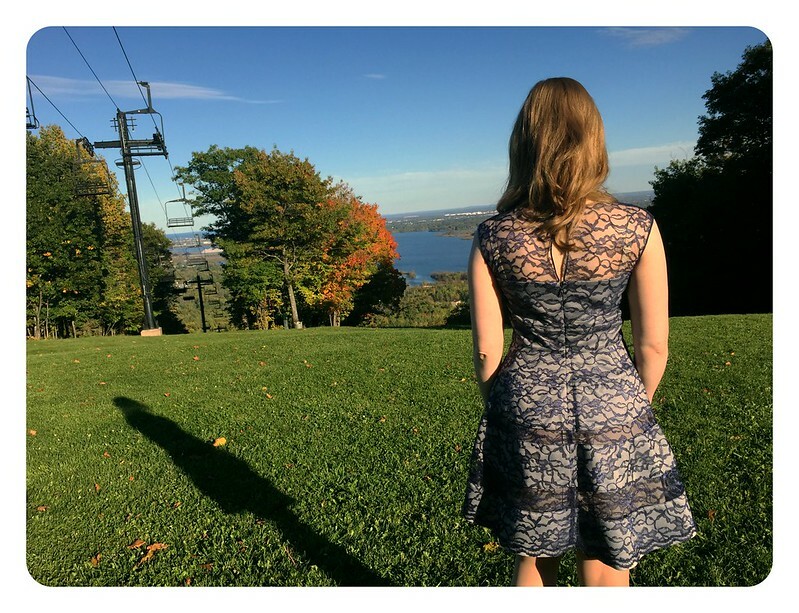 Not the fabric itself–that was lovely–but my decision to deviate from the pattern’s recommendation of pre-quilted fabric. 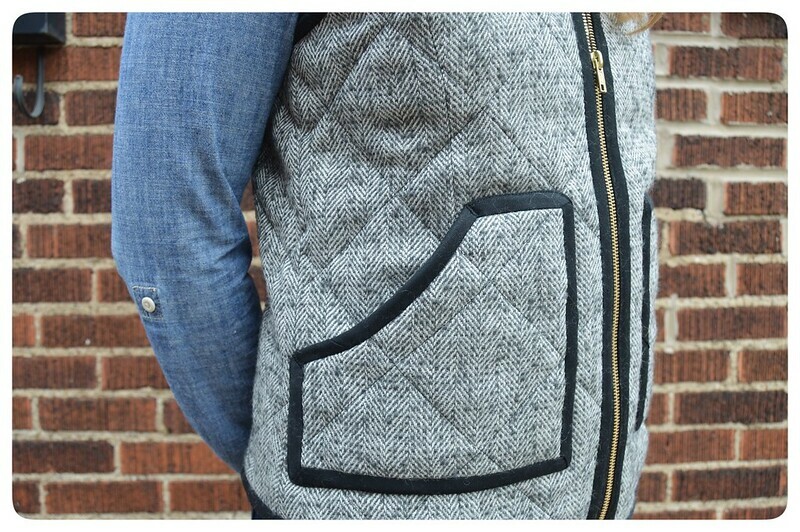 I wanted something more substantial and close to the inspiration vest, so I chose to quilt together the outer wool, a flannel lining, and a warm batting. 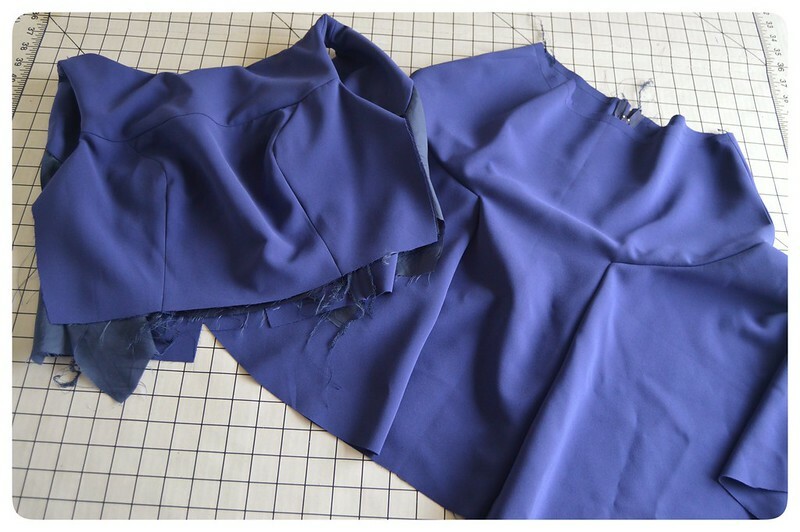 I wanted my quilting lines to match across the princess seams on the front and back pieces as well as they could, so I assembled each of the three layers individually and then basted them together around all edges and through all seams before quilting. This alone took some time, but didn’t cause any trouble. Then I tried to machine quilt, and it was a disaster. I tried a few techniques to keep my lines straight and prevent my lining (the underneath layer) from puckering, but it just wouldn’t work on my machine. I called my mom in frustration, and she found a walking foot that she had never used in with her sewing machine accessories. I brought my vest to Minnesota when we visited this summer, consulted with Mom about the best course of action, and had great success using the walking foot! Hooray! If only those darn things weren’t so expensive, I’d get one for my own machine. After the quilting had been sorted out, there were miles and miles of binding to contend with. I wanted a more substantial bias binding, so I chose to make my own using a medium weight twill from JoAnn’s instead of the prepackaged stuff. It took an awfully long time to apply it on all edges. I don’t pretend that my work is perfect–I don’t have the mitered corners of a quilter–but it’s good enough for me. 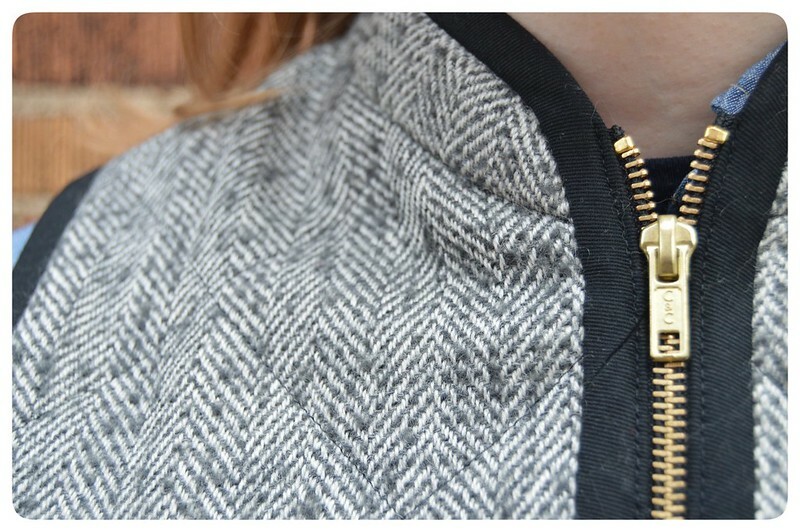 The vest is topped off with a gold separating zipper. I remember feeling so close to being finished when working on the zipper…and then having to try three times for proper insertion. The zipper is attached to the bias tape, and that bias tape really wanted to shift while sewing, meaning that the bottom corners didn’t align properly. I honestly don’t remember how I dealt with this (maybe I blacked out from a bit of sewing rage), but I think that I did some very thorough hand basting. I don’t think I’ll be making a closet full of these vests as I had originally hoped, but I really am glad that I saw this project through to the finish. I’ve gotten a ton of wear out of it since finishing in December, and I know I’ll get lots more use out of it in the future. And besides, the wool wouldn’t have sustained a flame anyway. 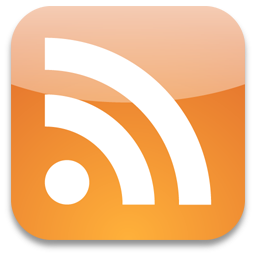 I’m not sure that I can do this project justice in a blog post, but I’ll try. 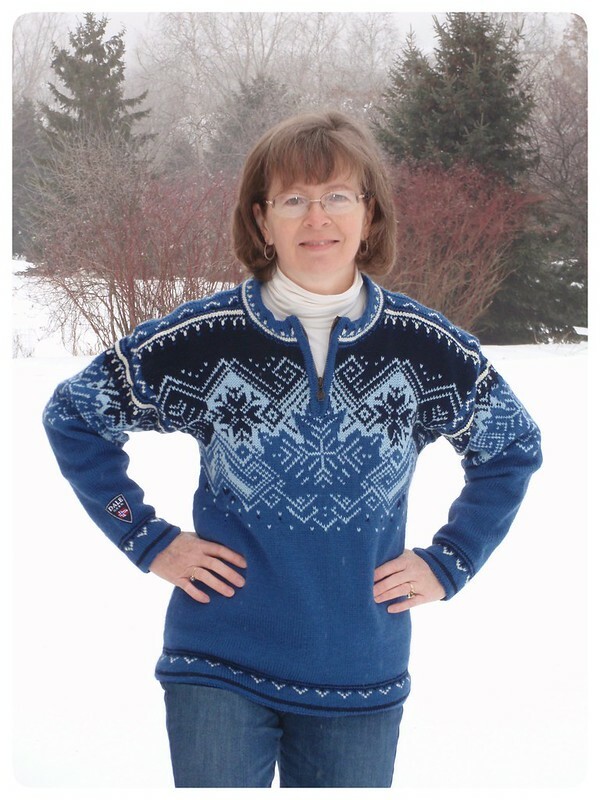 Years ago, when I was knitting on Steve’s Le Massif sweater and working at an LYS, my mom asked me to knit her a Dale of Norway ski sweater. 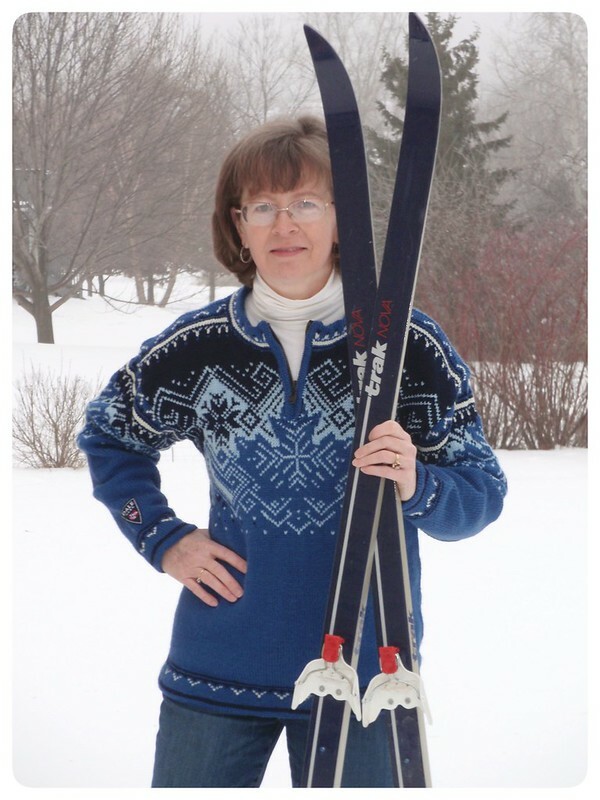 She’s done quite a bit of cross country skiing and liked the iconic look of the Norwegian ski sweater. Of course I said yes, both because she’s my mom and I’ll knit her whatever she wants, and also because I enjoy knitting ski sweaters but have little interest in wearing one myself. 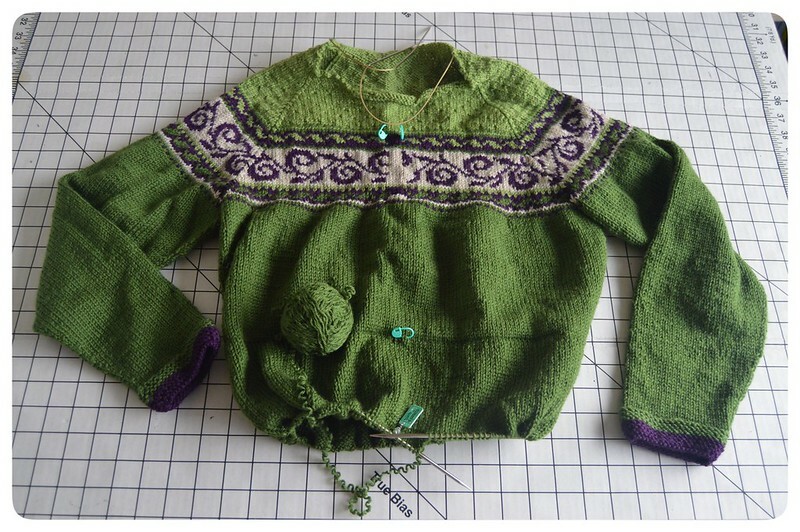 Mom knows her way around ravelry, so she dug through the Dale of Norway archives and settled on Whistler, the 2005 Olympic design. 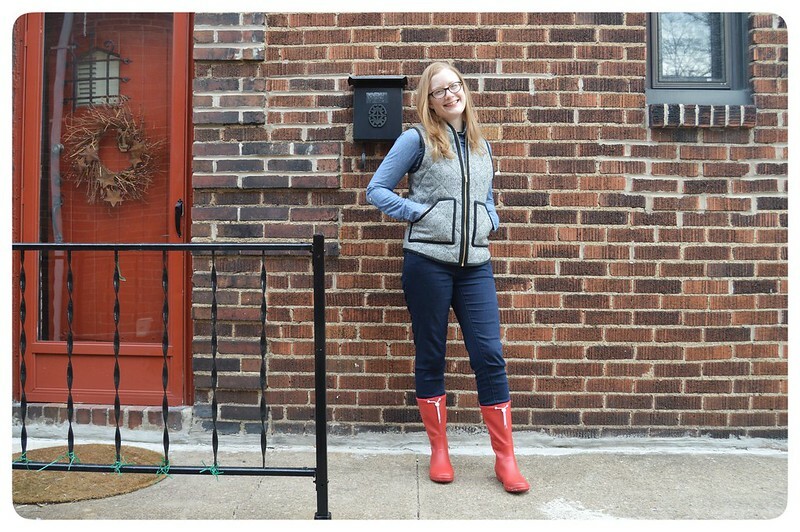 She wanted a versatile color combination that would work well with jeans, so she chose shades of blue. As Steve said as I was finishing the sweater, it just looks like my mom! Just as I’ve told anyone who’s ever been impressed by me knitting these designs, a sweater like this one is more a test of endurance than anything else. 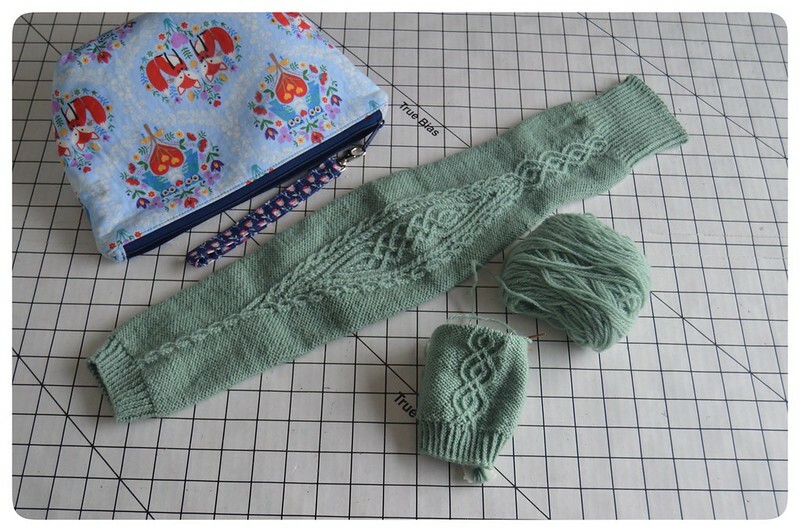 It’s not especially difficult knitting (though you do have to juggle some large charts), but there’s a whole lot of it! And once you finish the knitting, it’s on to the finishing. Despite having steeked and finished a few sweaters in the past, I still underestimated how long the finishing work would take on this sweater. 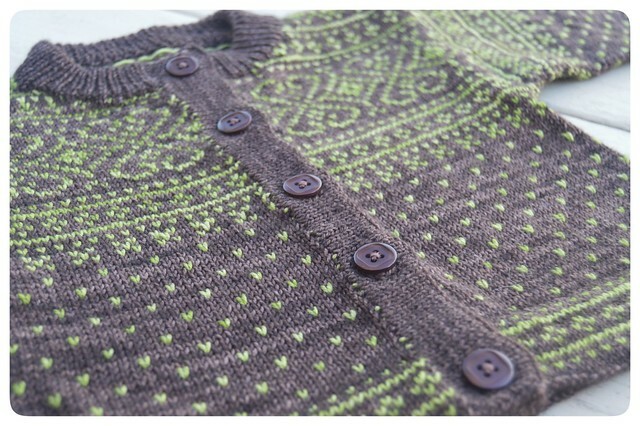 One reason for this was that this design isn’t nearly as knitter friendly as Le Massif. 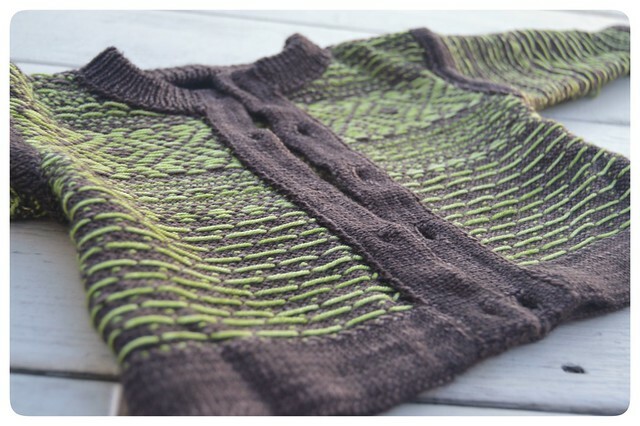 There were more rows that required me to carry three colors of yarn, and I had to do a lot of duplicate stitch–I think it amounted to around five solid hours–before I could get to the actual assembly of this sweater. I do believe that all of that hard work pays off in the end. 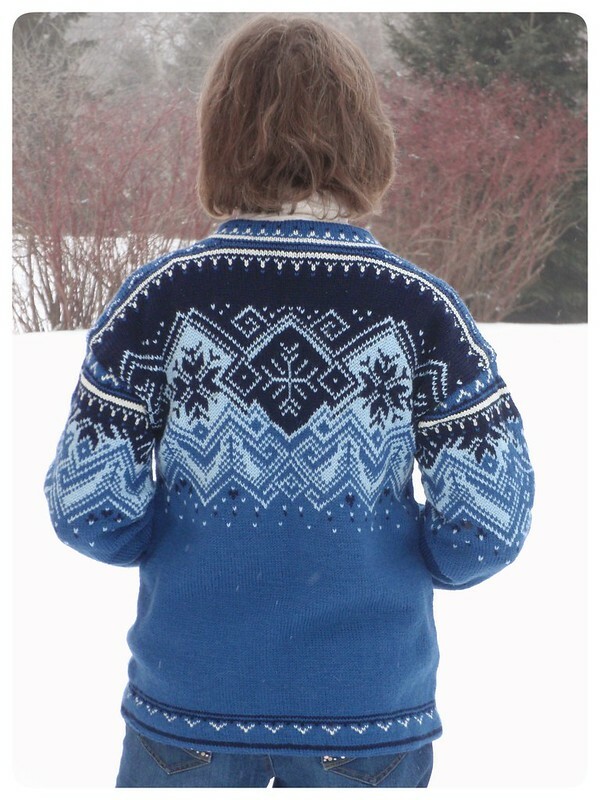 Dale of Norway sweaters are really beautiful, and my mom was pleased with the finished piece. She loves the way it fits and tells me that it’s much more comfortable than she expected. Steve finds his ski sweater to be too hot, but Mom is able to wear hers without overheating. Special thanks to my mom for her patience while I knit this sweater and for modeling for photos. As this blog has evolved and I’ve been making more of an effort to work on something each day and see projects through to the end, I’ve increasingly posted about finished projects. With limited time for blogging and taking photographs, it makes sense to focus on what’s done. But I do miss talking about works in progress, so I thought I’d try popping in around the turn of each month to share what’s on my crafting table. My sweater project is Georgetown, and it’s nearing the finish line! So far, I’ve knit the back, both fronts, and one sleeve, which means I have a sleeve and a big shawl collar to go. 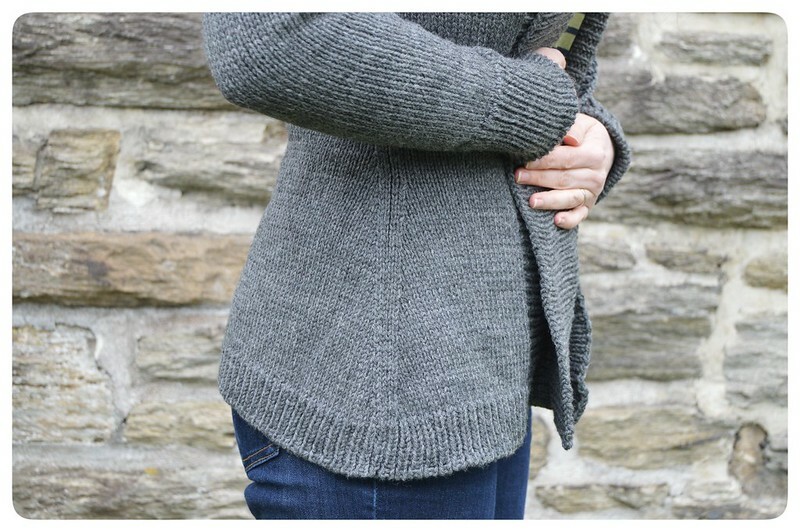 To be honest, I was hoping for something a bit more luxurious, but I kept coming back to this workhorse yarn in a heathered gray at the LYS. Don’t mind the rolling in this photo–all of the pieces are stockinette and haven’t been blocked or seamed, so they really want to roll in on themselves. I’m so excited for this sweater to be finished! 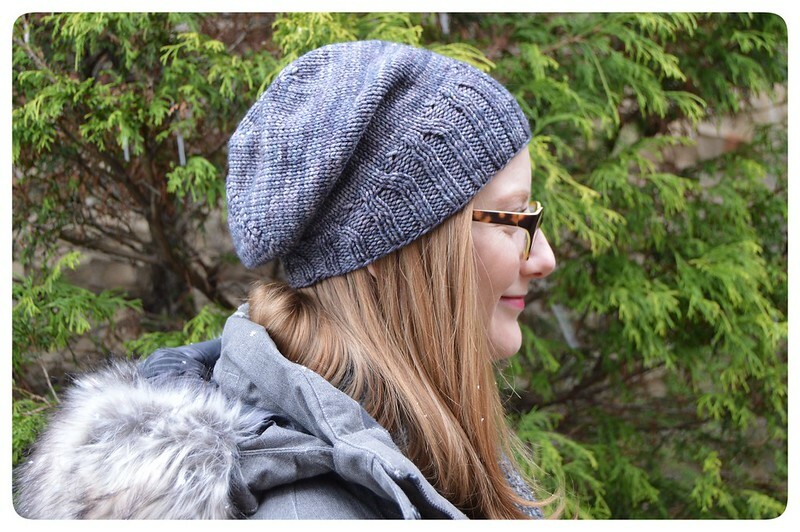 It’s been a nice, fairly mindless project to knit, and it’s going to be so snuggly to wear. 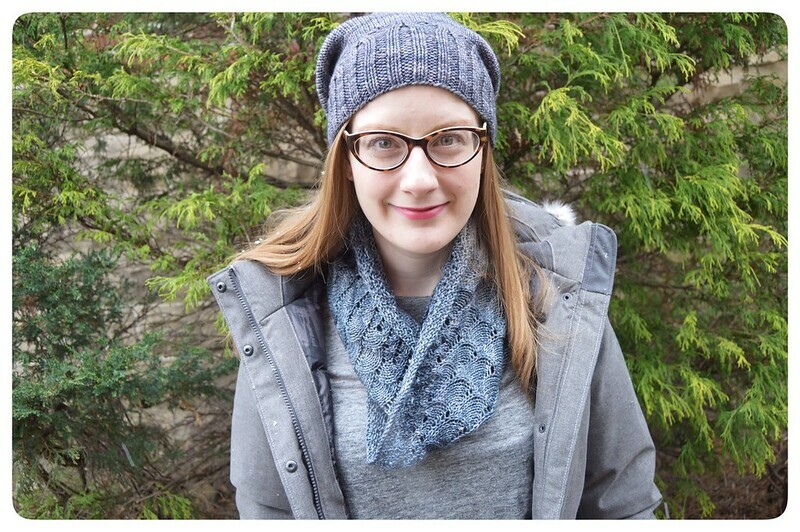 I’m using Cascade 220 for this project. 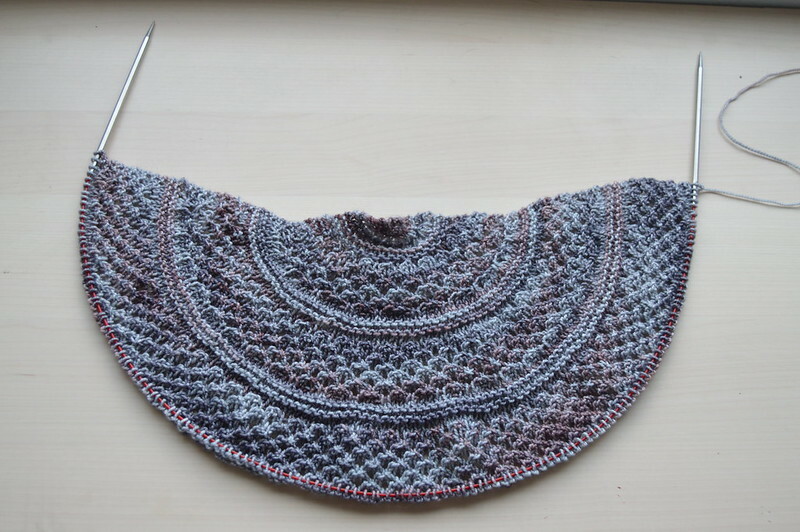 Lilli Pilli, a beautiful shawl that combines garter stripes and lace, is my other big project at the moment. 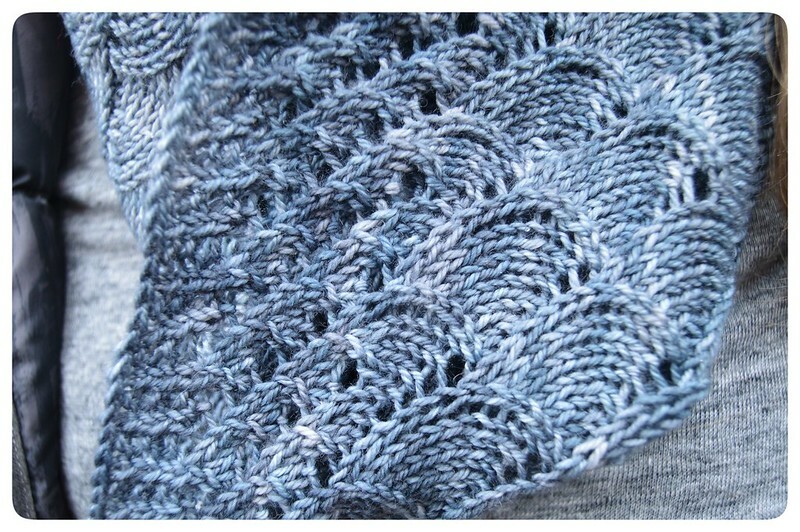 I’m knitting this one as part of a KAL, and I’ve fallen a bit behind on it. I joined my husband to eat enormous amounts of melted cheese watch the superbowl, and I guess I was a bit overzealous in my knitting, because I had some lasting wrist problems from working on Lilli Pilli. I had to step away from the knitting for a while, and I’ve transferred all of my projects over to bamboo needles that are easier on my hands. I think that this one will be easier on me when I’m back to garter stitch, though I have no idea why this particular lace pattern is bothering me since there aren’t any stitches in it that have bothered me before. 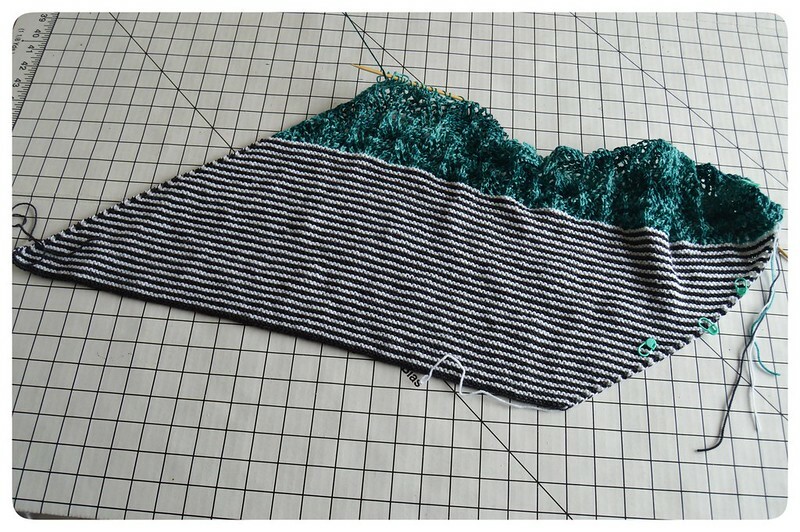 It’s a real shame because I just love the Three Irish Girls colorway I’m using for the lace portion, and I spent the entire garter section thinking about how neat it would be once I added the pop of color. When I took this picture the other day, this project wasn’t even a WIP, but it is now! 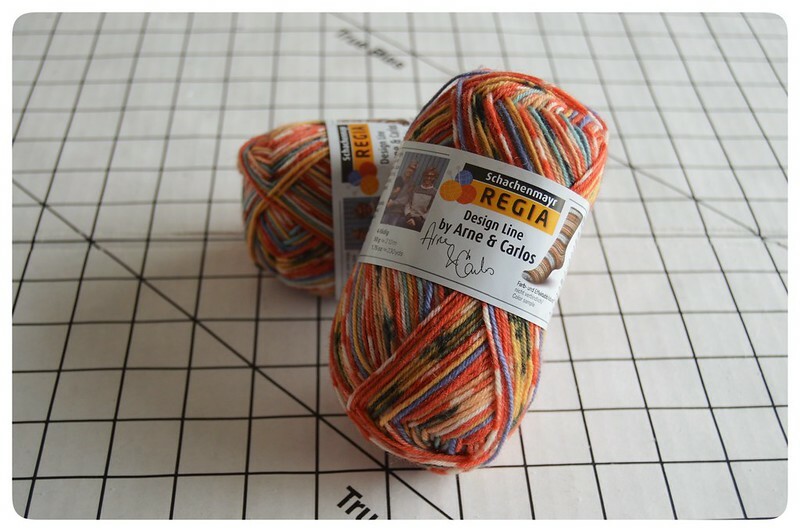 I’m on a bit of a sock knitting adventure that I’ll explain another time, and this Arne & Carlos yarn in a cheery orange is for my latest pair. I’ve heard that some colorways of Arne and Carlos can be difficult to find, but my LYSs in both Duluth and Pittsburgh had a decent stock. These will be pretty plain vanilla socks with my first try at a Spacious OMG heel. I’m just past the heel turn, so they are cruising along. 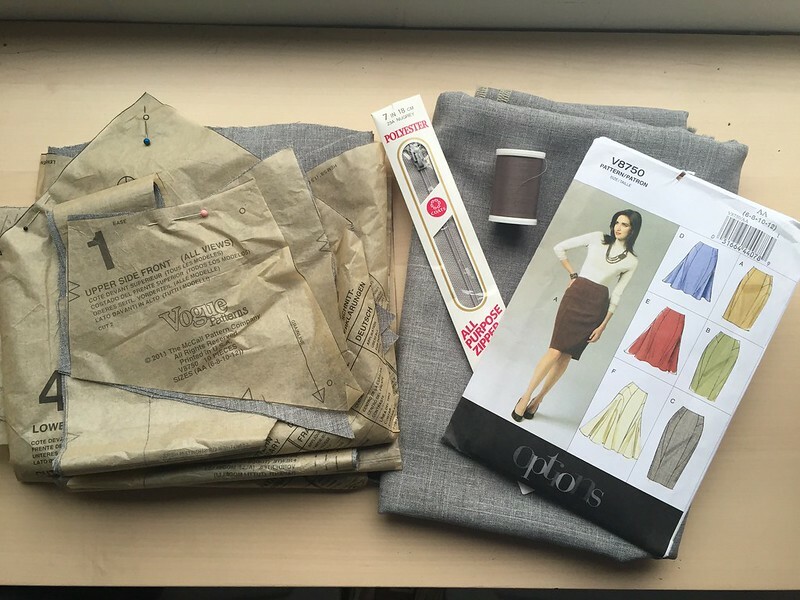 I am once again attempting a Pattern Review Wardrobe Contest, which requires ten items sewn in two months. I dug around in my stash, and luckily enough, most of the fabric I had set aside for work garments can go together (at least well enough) for a capsule wardrobe. I’m also behind on this challenge, so there’s a good chance I won’t finish, but at least I’ll get some of these projects sewn up and in my closet. On the right is my TNT shirt pattern in a blue gingham, and on the left is a new-to-me shirt pattern in a Robert Kaufman lawn. 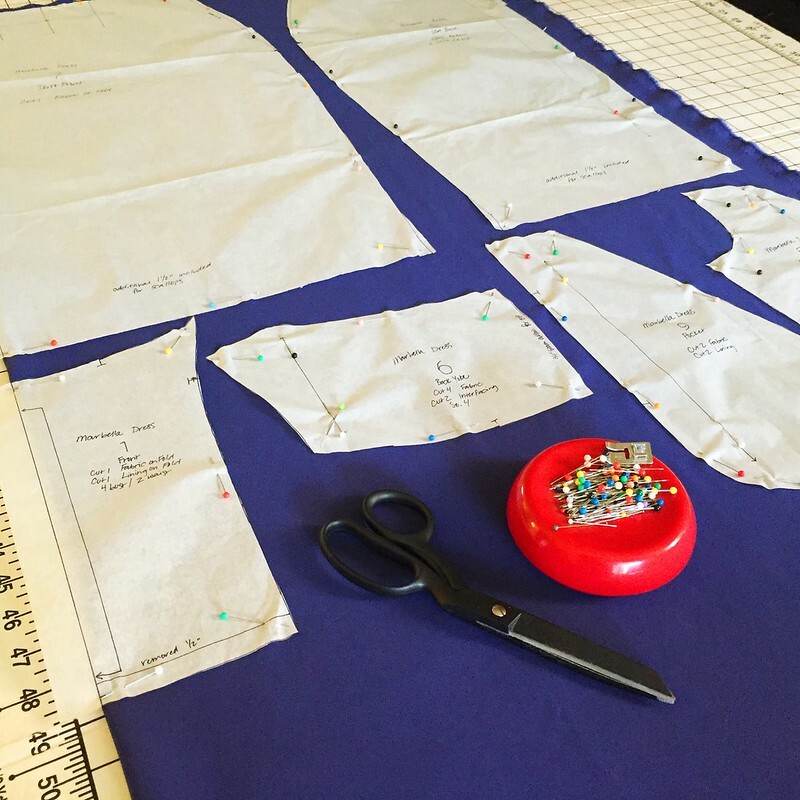 I have to say, sewing fitted buttondowns for myself really makes me appreciate how quickly I can make a shirt for my husband when I don’t have to deal with all of this shaping. 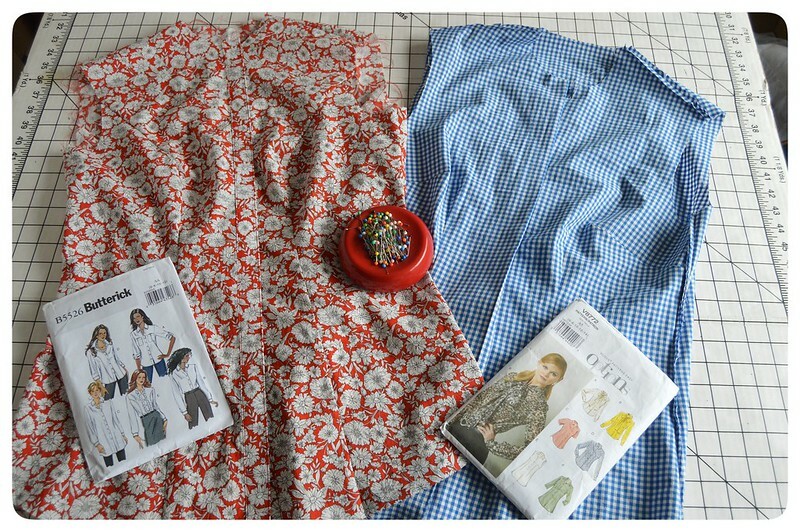 The floral shirt has princess seams in front and back, and the gingham shirt has a total of eight darts, so it takes much longer to assemble the body of the shirt, especially when using french seams. 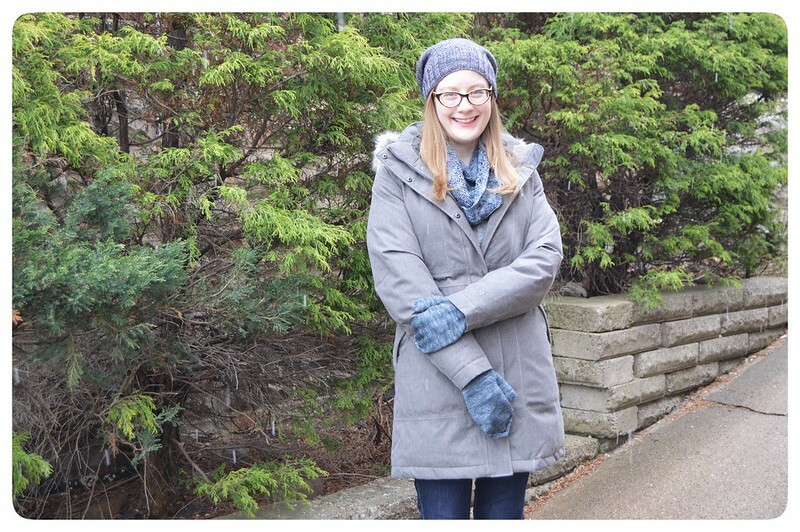 I haven’t forgotten about my coat just yet! Lady Grey is puttering along at its own pace. It doesn’t look like much, but I’ve done a bit of the tailoring so far, and I’m ready to get to work pad stitching the collar. I find working on this project really enjoyable when I’m doing it, but it often gets passed up for projects that will be finished and worn more quickly. I have a feeling that this one won’t be done until it’s too late in the season to get any wear out of it, but as long as it’s out of my sewing room, I’m happy. That’s the gist of it around here. I hope you enjoyed this little peek into my WIP pile, and I’ll check in again next month. Hopefully all of these will be FOs by then!